With the compact metal housing design and equipped with a full range internal power supply, the GSD-805 is ideal to be installed for desktop or space-limited environment. Benefit from the convenient internal power, users can directly plug the device’s power cable in the outlet without additional cumbersome power adapter on the wall. To comply with European Union’s Energy-using Products (EuP) Directive for further reduce the energy consumptions, the GSD-805 has a built-in power switch with off mode and standby mode selection at its rear panel. PLANET Green Networking Switch greatly helps to eliminate the power consumption at home, lower the business operation cost and fulfill the responsibility of a corporate citizen. With 8 RJ-45 10/100/1000Mbps ports for high-speed network connectivity and up to 16 Gbps non-blocking switch fabric, the GSD-805 can easily provide a local, high bandwidth Gigabit Ethernet network for Small Office, Home Office or home backbone applications. 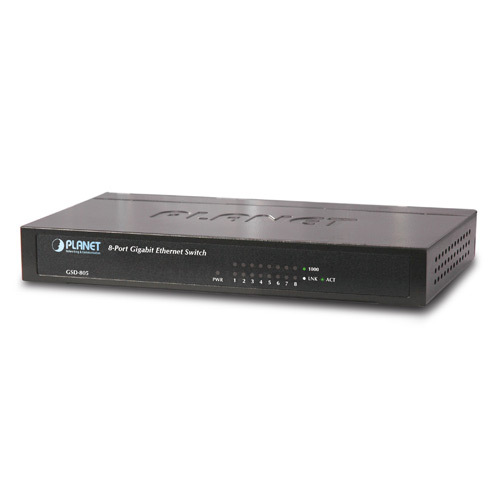 PLANET GSD-805 Gigabit Switch provides the best solution to high-speed Internet environment demanded by SOHO / Home and Power users. This Switch fastens the speed of data transmission between devices without worrying about lag when playing high quality multimedia. In the aspect of application at home, the GSD-805 integrates the speeds of 10, 100 and 1000Mbps which can fulfill your demands of transmitting high quality multimedia, games and other high speed Internet applications. 2011-02-17 2.0 Release for hardware version 2.0.